Welcome to Resensitized. Home of the OFFICIAL PKer list and Zerg Liste. A-HA! Not only does it still exist, I can still log in here! Tom Challenger woke up to find a bunch of identical humans in the same building, all created over the last couple of days. Edit: After some prodding, here are two of them acting within a minute of each other, in sequence. At The Food Court / Dempsey Grove Mercenaries zerging? When the Gore Corps made our return a few months ago, we naturally found ourselves in immediate conflict with the Greater Homeland's largest organised resistance group: Roftwood Coordination Center (hereafter referred to as RCC), an alliance of multiple groups and individuals based around Roftwood and active between there and Stanbury Village. Having been out of the game a while, a couple of the group names were unfamiliar, such as Roftwood Elite and, especially, Dempsey Grove Mercenaries (hereafter referred to as DGM). The latter was a mix of a few new accounts created in April, plus a couple of older ones that were oddly low level at that time, indicating that they had been subject to prolonged periods of inactivity. Their modus operandi was very much in the bounty hunter vein, in that they would concentrate on grouping together to kill breathing members of the Gore Corps, while doing nothing about the actual spread of ruins. As such we viewed them mostly with amusement. It was nice to see some organised opposition, but they weren't really doing anything that caused any significant inconvenience, so we mostly ignored them. Then on the 15th of August, something happened that got our attention. On the day we chose to attack Dempsey Grove Police Department (home of DGM), as it was the most populated resource building left. We broke in as usual and found a few DGM inside, but concentrated on the job in hand. Then one of the DGM became active and left the building. Then another. Then the third. That's not improbable. Guy notices they're being attacked and messages the others on their Discord server, so they all move out too. The weird part was what happened next. Every few seconds, one of the DGM would jump in, say a couple of lines, maybe take a couple of shots, then jump out. Only one would ever be in the room at once. Zero crossover. Because we were concentrating on our strike we didn't get the screenshots that I would, with the benefit of hindsight, have prioritised. So, we'll ask for your faith on that part. From here on out, we have everything documented. In the Corps we're no strangers to organisation and we share screenshots of our strikes. Want to know something that we've never seen before in all our twelve years though? 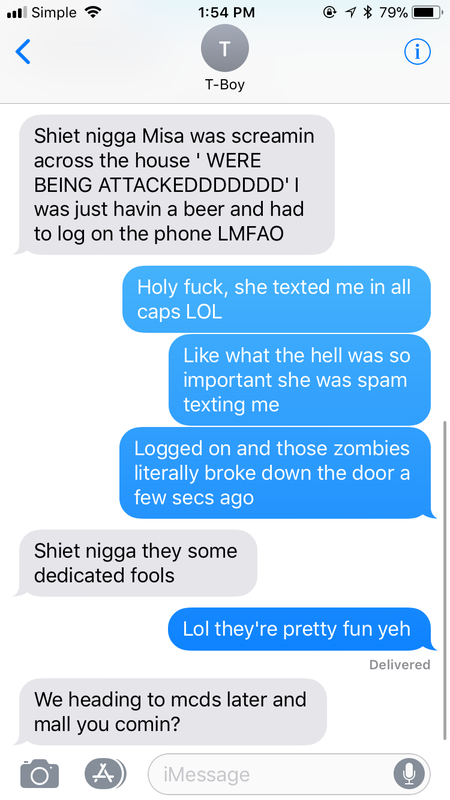 Screenshots of people's phones, discussing attacks/being attacked via text message. Seems a bit weird, no? It just appears very, very staged and it's safe to say we were pretty suspicious at this point. So, we started looking into things. First thing we noticed was that there is a DGM subgroup on Discord. The weird thing though? Kuozai is the only member. So, six active members, five visible in Roftwood and another two inactive, yet there is only ONE member of DGM on their Discord server? That does not add up, at all. Classic zerg signs include blatantly similar profiles, with two (Kunaty and ChesySan) having 'unreadable collars', five (Chado Kun, Kuozai, LovelessHeart, Tisute and Zero Two) referring to an alligator yin/yang symbol, as well as three of the accounts having been created within five days of each other. Obviously it goes without saying that LovelessHeart and Heartless Lover are the same person. The yin/yang could easily be considered an indicator of a group 'uniform', which isn't unheard of. I have included it here for it to be considered alongside in light of other issues that we have uncovered. Now, I hear you saying it: “But I see rows of Gore Corps in those screenshots too, as well as GC attacking in succession.” It's true. That stuff is not abnormal for a strike team. In fact, it's the norm for any half-decent one. However, if you visit the RRF on our Discord we can point to each of our members on there. Hell, we can get them to come out and invite you to forsake your pants and embrace Barhah. We're a large, active and diverse group, each with their own style and, most importantly, their own Discord account. In short, we can show you that we're all single players doing our thing. I'll repeat: On the RCC Discord, the ONLY DGM listed is Kuozai and the only time we ever see mention of the rest of the 'team' is via a suspicious text message and him referring to them on a couple of other occasions. All very convenient. Well, in answer to your question, Kuozai is Kunaty. Look at that list: Kunaty, Kunati, NeO_Kunaty, etc, etc. Also Tony. Take a look at Kunaty's profile (or the screenshot of it in case he edits it). What's the real name? Tony. There's Kunaty, there's Kuozai, both attacking. Slam dunk, zerging. But there's more. There is also adequate reason to believe Kuozai/Kunaty is also Tisute. What letter is just to the right of T? Yeah. Tisute is basically just a typo of Tisuye, which just happens to be a name that Kuozai/Kunaty has been using online too for years. Far too convenient. Okay, so there's the proximity of time factor that I mentioned above, as well as the issue of him being the only DGM on their Discord. While you might still, in spite of all the evidence, be clinging onto the idea that the other accounts might be legitimate, let's take a look at something from Kuozai/Kunaty/Tisute's history in the game. Think about it: He was 'speaking for' someone who never became active in the metagame and vanished when people suspected zerging did not accept her without an account on their forum. Now DGM have EIGHT accounts (that we've found so far), but only one, Kuozai, is in Discord. Take all the above and add that in. Do you really believe this is a strike team? Discord isn't some arcane darkweb site. It's huge and easy to use. Why the hell is no-one else in this 'group' using it? Because there is no group. He 'speaks for' them because he is them. He's a zerger and every account in DGM should be considered highly suspect and treated as a zerg. There can be no question that something stinks with Dempsey Grove Mercenaries. There is concrete evidence linking three of the five accounts that are active right now in Roftwood. There is also ample circumstantial evidence linking the others too. As a part of this investigation we have considered the possibility that another player or two is involved in DGM, but they for some reason choose not to metagame. However, combining the 'ACC and the phantom Chesy' incident, several instances of suspicious bunching and movement patterns and, of course, the cast iron certainty of connection between at least two, and probably three of the accounts, leads us to believe that at absolute best Kuozai created half the DGM line-up and has password access to all of them. In the past, when groups have been shown to be dispropotionately riddled with zerging to this extent, the Zerg Liste has taken the step of adding all members as zergs until conclusively proven otherwise, or adequate and permanent separation steps are taken, on pain of permanent listing in the event of any second offence. We feel that this is an appropriate response to Kuozai and DGM. With regard to RCC, we believe there is no reason to suspect any ill intent on the part of the organisation as a whole, nor any of the other constituent groups. We've enjoyed a lively banter with them and, while the position of Kuozai as an administrator on their Discord gave us pause, we think it more likely that they have been duped. At worst they may be guilty of not asking a question, the answer to which they likely feared getting, and who hasn't been there in their lives? All that said though, we will be very interested to see how they respond to this and what steps they take. The Zerg Liste / Dempsey Grove Mercenaries zerging? Part Three: Who is Kuozai? unfortunately I'm not allowed to send you PM. I have not been using this forum for years. Is is possible to delete permanently my account? Yikes do I need to do something ? Well, yes. Otherwise, what have we been paying you for all these years? 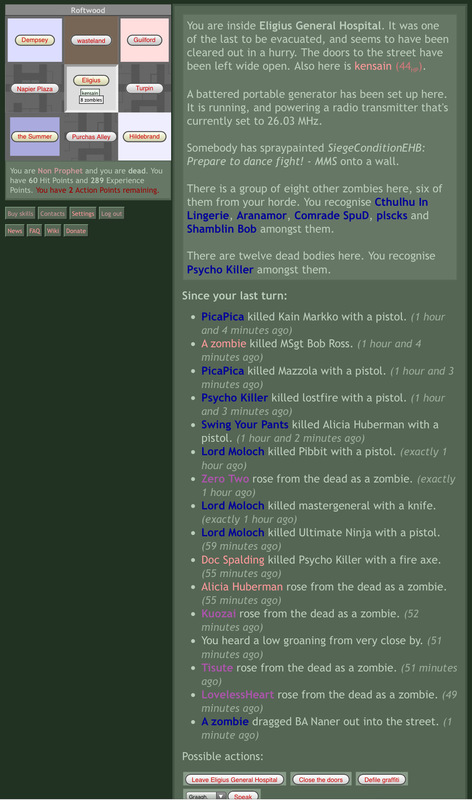 If you, or anyone else gets around to it, could you take a look at these IWits and add these dimwits to the Zerg List? These two could be "innocent bystanders" but I rather doubt it. Not with one having the exact same or close start date as the ones listed above. Well, now I.m really, really sad. Not only is the game slowly dying, but this forum seems to have died. No one has posted in it in 5 months. So very sad. Never mind! I guess the zerg list is still active, just nothing else.